Discussion Forum: Final Score 2018 NFL replay - Tabletop-Sports...Where Rolling the Dice is King! The 2018 NFL season began with a Thursday night game between Philadelphia and Atlanta, a rematch of their 2017 divisional playoff contest. The Eagles won this one, too, 37-28. --Carolina scored a mild upset over eventual NFC East champion Dallas, 29-9. --The L.A. Rams went to Oakland and beat the Raiders, 26-23. The Rams came out strong, leading 14-3 after the 1st quarter, but Oakland played a surprisingly competitive game the rest of the way, and almost pulled off a major upset. 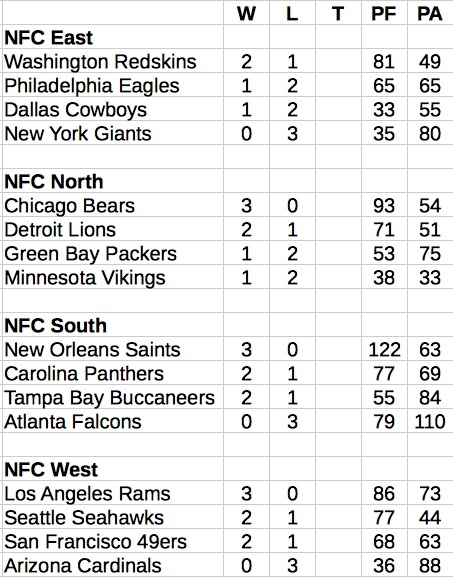 The Rams had an "R" offense, the Raiders "H," the biggest mismatch of Week 1. --Looks like teams will have their hands full with New Orleans again, as the Saints annihilated Tampa Bay, 50-19. Will be following. I have thought about trying Final Score Football. It's a good way to get an overview of a league. Although I still enjoy Ultra Quick FB, the teams come to life a bit more in Final Score. The game is broken into quarters, so you get the ebb-and-flow feeling, too. There's also a Big/Bad Quarter Chart for extreme results. 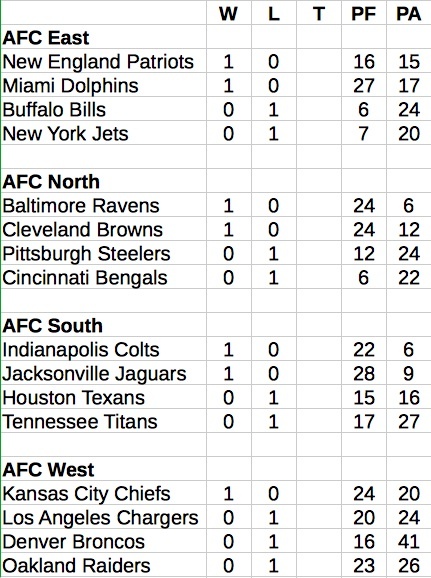 After just two weeks of the season, only 9 of the 32 NFL teams have won both of their games. --First overtime game, between the Dolphins and Jets, mediocre offenses, neither team was able to score in overtime, game ended in a 19-19 tie. --Big upset in Tampa, as the Buccaneers beat the Eagles on a last-second field goal (in my imagination anyway). Philadelphia held a 15-13 lead going into Tampa Bay's final roll. They needed a dice roll over 16 to score, and they got it for a thrilling 16-15 win. --Mismatch of the week saw Arizona visiting the L.A. Rams. "E" offense for the Cardinals, "R" for the Rams. Arizona started slowly, but managed to score a pair of second half TDs, forcing the Rams to put 6 points on the board in the 4th quarter to secure the 23-20 win. 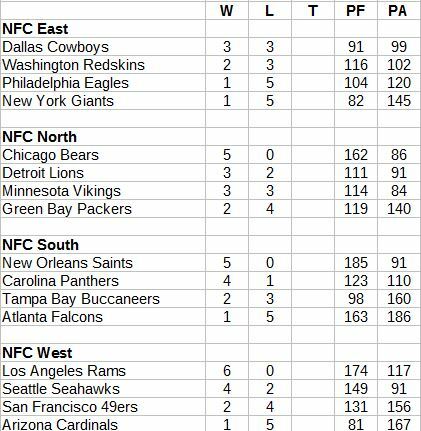 --Finally, Monday Night Football featured Seattle and Chicago, from Soldier Field, where the Bears enjoy a solid home-field advantage (1/1). The game was as good as advertised, the Seahawks scoring a 4th quarter TD to tie the game at 20, the Bears answering with a late field goal to remain unbeaten. --Biggest upset of the week was the 49ers going into Kansas City and handily beating the powerhouse Chiefs, 30-16. --Oakland narrowly escaped with a 23-20 win over the Dolphins in Miami. A last-minute field goal attempt by Jason Sanders just drifted wide (the dice roll missed a game-tying 10-point score by one). --Chicago defeated hapless Arizona 34-10, the game noted only because it was the first time this season a team ran its offense out of the "A" column. The Cardinals did well to score ten points. --Fans in Los Angeles got their money's worth as the Rams and Chargers put on quite a show, the home team coming out on top, 37-30. The score was tied 23-23 after three quarters, the Chargers scored a TD in the 4th quarter to take a 30-23 lead, but the Rams answered with a pair touchdowns to remain unbeaten atop the NFC West. I love this game. I am currently playing the 1967 AFL and NFL. Are you playing any other games beside Final Score? I've played a few 60's and 70's seasons with Ultra Quick Football. Still enjoy it. 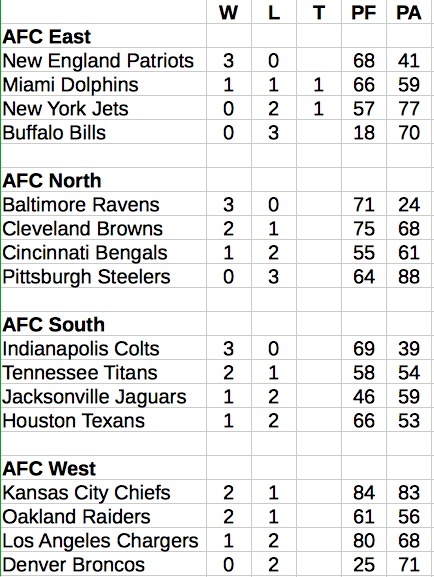 I need to pick up more NFL seasons for Final Score. Right now I have some college seasons, and the defunct leagues set (WFL, USFL and others). 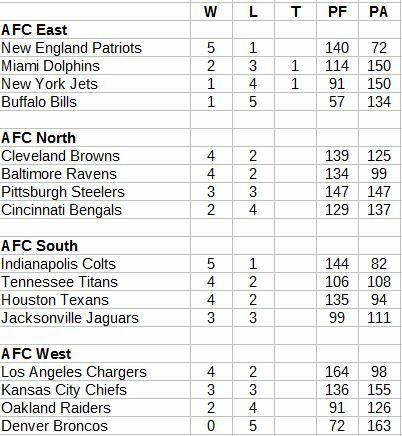 Once you've wrapped up 1967, post some results if you get a chance, would be interested to see the final standings. 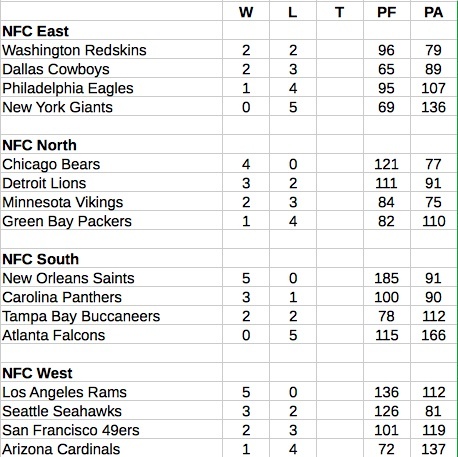 --Down to 4 unbeaten teams now: Bears, Rams, Saints, Patriots. The previously undefeated Colts and Ravens both lost--the Colts to the Texans 26-25, in spite of Indianapolis scoring 14 4th quarter points--and the Ravens to the Steelers in Pittsburgh, 27-16. 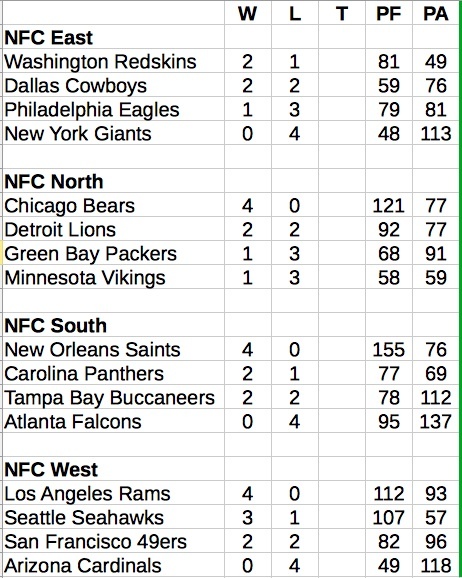 --Five teams are winless after Week 4, the most surprising of this group is the Falcons, whose actual record was 7-9, although after four games it was 1-3. They have scored a respectable 95 points, but their defense has allowed 137 points, worst by far in the league. Their defense rating is +1, not great, but not the worst either. 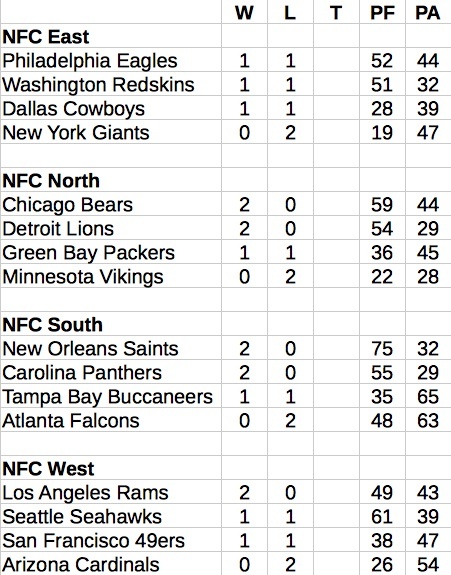 --The Saints, as expected, lead the league in scoring with 155 points, 38.75 per game. Their actual average was 31. However, they haven't yet played a team with a minus (meaning good) defense. Next week they face Washington and their -2 defense on Monday Night Football. 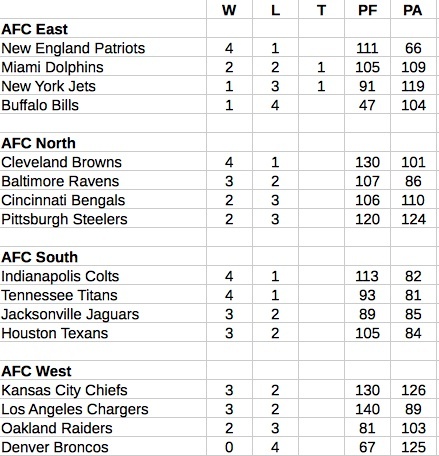 --Down to 3 unbeaten teams now, all in the NFC, as the Colts went into Foxboro and beat the Patriots 19-17. Indianapolis was down 17-7 at the half, but shut out New England in the 2nd half, and scored 12 unanswered points for the win. --Cleveland sits atop the AFC North after defeating the visiting Ravens, 35-20, thanks to a 21-point 4th quarter (Big Quarter x 2). --The Jets and the Broncos played one of the most exciting games of the season, New York winning 25-19 in overtime. The teams exchanged field goals to start overtime, then the Jets scored a TD for the win. 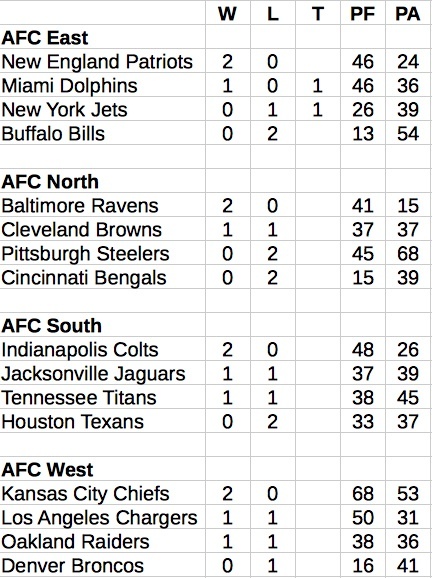 --In Kansas City, the Chiefs couldn't get their vaunted offense untracked, and Jacksonville escaped with a 20-17 upset. 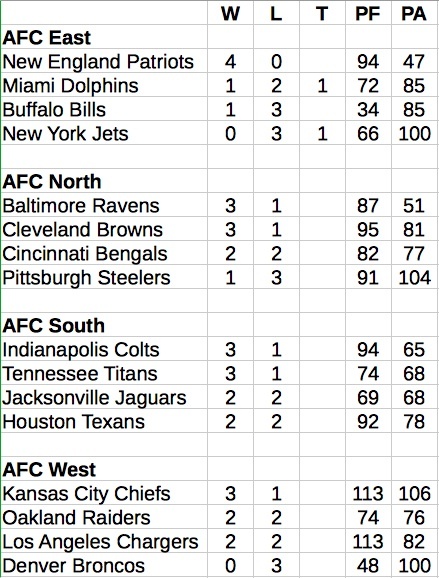 F vs. N offense, but the difference in the two defenses (-3 Jaguars, +1 Chiefs) made the difference. 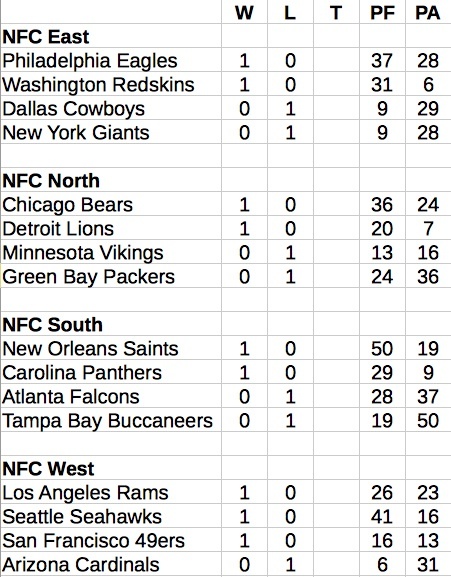 --The three undefeated teams remain that way, the Bears and Rams easily winning their games, the Saints with a Bye week. --Two of the three winless teams finally came out on top, the Giants beating the Eagles 13-9, the Falcons running roughshod over the Buccaneers 48-20. --The Colts maintain their lead in the AFC South with a convincing 31-0 win over the Jets. New York got hit by a -2 deduction from the Colts' defense, and another -1 due to their poor performance at MetLife Stadium. --The big Week 7 match-up has the 5-0 Bears at home vs. the 5-1 Patriots.